The former home and artists' studio of sculptor Karl Duldig (1902-1986) and his wife - artist and inventor Slawa Duldig née Horowitz (c1902-1975). "The Duldig Studio offers visitors the experience of the working environment of a distinguished sculptor, and his wife, an equally talented and interesting artist. It gives an insight into the cultural life of Melbourne and Australia at a time of enormous change, politically and artistically. This is a profound lesson in the experience of migration transforming the life of the nation." Our vision is to be recognised as a pre-eminent Australian artists' house museum that inspires, informs and engages through art and the story of the Duldig family's creative journey. The Duldig family home was opened as a museum in 1996. In 2002, the association, The Duldig Gallery Inc. became incorporated as a public museum and art gallery to operate the Duldig Studio. It is a tax exempt charity and recognised as a deductible gift recipient institution under the Commonwealth Government’s Cultural Gifts Program. At this time a gallery space was added to the original house so that changing exhibitions could be mounted. Within the house a number of rooms are maintained as they were during the family’s residence. Karl’s original studio, with kiln, tools and work across all periods has been kept as it was left by the artist, and in the adjoining garden the bronze and terracotta sculptures also remain in situ. In 2015, the Duldig Studio achieved Full Accreditation under the Museums Australia (Victoria) Museums Accreditation Program and in 2016 it was a Finalist in the Museums and Galleries National Awards for Interpretation, Education and Audience Engagement. The Modernist art of Karl Duldig is internationally acclaimed and represented in cities as diverse as Canberra, Vienna, Tel Aviv, New York and Singapore, as well as the province of Fujian, China. His art is included in the collections of the Australian War Memorial, National Portrait Gallery, National Gallery of Australia and National Gallery of Victoria. A prototype of Slawa Duldig's umbrella invention is in the Museum of Applied Arts and Sciences collection, Sydney. 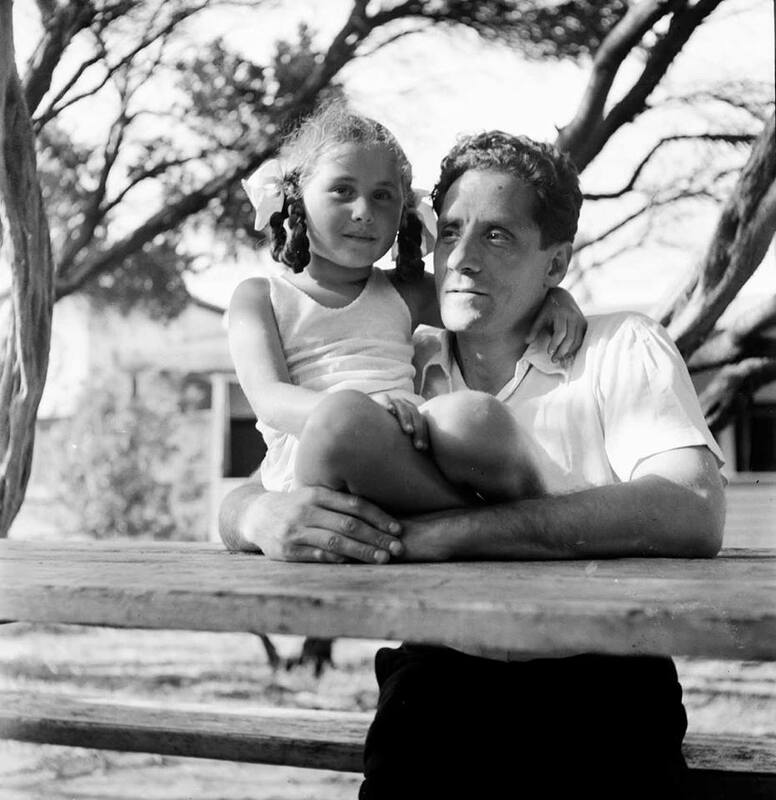 Recordings of the artists' daughter, Duldig Studio Founder and Patron, Eva de Jong-Duldig are in the National Library of Australia. John Petersen, historian, talks about the Duldig Studio, an artists' house museum that tells a modern Australian story. Born in Przemysl, Poland, in 1902, Karl Duldig moved to Vienna with his family in 1913. In his youth he was an outstanding sportsman, won the Austrian table-tennis championship, played international soccer, and was a highly ranked tennis player. In 1921, he became a student at the University of Applied Arts in Vienna where he worked for three years under the noted Austrian sculptor Anton Hanak. His work was chosen to represent the institute in major national and international exhibitions. In 1926 he became a student at the Academy of Fine Arts, Vienna, and from 1929 to 1933 he was a member of the Academy’s prestigious Master School in Sculpture under Professor Josef Mullner. After his graduation he shared a studio with Dr Arthur Fleischmann, worked on private commissions, and exhibited in the Kunstlerhaus and the Secession. Together with his wife Slawa, and baby daughter Eva, Karl left Austria in 1938. After a short period in Switzerland the family arrived in Singapore in 1939. There, Duldig completed major commissions for the Sultan of Johor and Aw Boon Haw, the Tiger Balm King. The eminent author and historian Robert Payne was his friend and among his patrons. The Duldigs were evacuated to Australia in 1940. Karl Duldig’s professional achievements in Australia spanned many facets of the arts. He was Director of Art at Mentone Boys Grammar School from 1945 to 1967; founding and Honorary Life President of the Bezalel Fellowship of the Arts; President of the association of Sculptors of Victoria and Honorary Life Member from 1982. In 1956 he won the Victorian Sculptor of the Year Award. Duldig participated regularly in important group exhibitions, including the Mildura Sculpture Triennial, New Influences Newcastle, Olympic Games Melbourne, Adelaide Festival, and Realities Sculpture Survey. From 1946 he was also a regular exhibitor with the Association of Sculptors of Victoria, and solo shows in Australia included: the Outdoor exhibition with Tolarno Galleries in 1969; the Retrospective at the Hawthorn City Gallery in 1975; and, the Survey exhibition at the McClelland Gallery in 1982-83. Karl Duldig is represented by significant works overseas as well as in Australia. In the Melbourne metropolitan area examples of his work in public places are best seen in the City of Caulfield Municipal Offices; Melbourne General Cemetery War Memorial; Council House, Little Collins Street; Kadimah Cultural Centre, Elsternwick; Kew Junction (Raoul Wallenberg Monument); and, St. Mary’s Church, Altona. In addition to the Duldig Studio, his work is held by major galleries in Australia, including the Australian National Gallery, the Australian War Memorial, and the National Gallery of Victoria, and by private collectors in many parts of the world. …und der Zauberschirm der Bildhauerin. Im Erfinderpavillon auf der Weiner Fruhjahrsmesse…Es gibt aber auch weiblicher Erfinder…so die Bildhauerin Slawa Horowitz, die einenZauberschirm erfunden hat, denman ganz klein zusammenklappen und in die Tasche stecken kann … Nr.58 Neuigkeits-Welt-Blatt Wein Mittwocjh 11. Marz 1931, Seite 7. Slawa Horowitz was born in Horucko, near Lwow in Poland, and moved to Vienna with her family before the First World War. After completing her matriculation, Slawa attended painting classes in Vienna, prior to becoming a private student of the noted Austrian sculptor, Anton Hanak (1922-1925). There she met fellow sculpture student Karl Duldig. 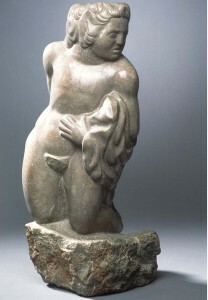 From 1926 to 1929 she studied sculpture under Professor Hans Bitterlich at the Academy of Fine Arts in Vienna. Until 1938 she exhibited regularly at the Kunstlerhaus and the Secession, and completed a number of private commissions especially in portraiture. In 1929 Slawa took out world-wide patents for her invention of a new folding umbrella called Flirt. The umbrella went into production in Austria and Germany, and Slawa received royalties from it until 1938. In 1939 she sold her rights to the Austrian manufacturer, Bruder Wuster. 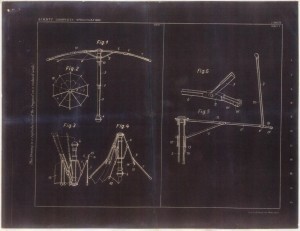 An example of Slawa’s handbuilt prototype of the folding umbrella is in the collection of the Museum of Applied Arts and Sciences (Powerhouse Museum) in Sydney, Australia. 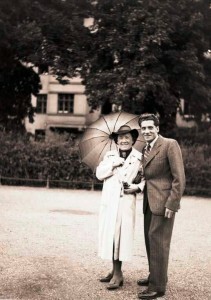 Slawa Horowitz married Karl Duldig in 1931. Their only child, Eva, was born just prior to the family’s departure from Vienna in 1938. After a short period in Switzerland, the Duldigs arrived in Singapore in 1939, where Slawa worked as an artist and teacher, and also restored valuable paintings in the Municipal collection. When war was declared in 1939 the Duldigs were designated ‘enemy aliens’. They were sent to Australia in 1940 for internment at Tatura and eventually settled in Melbourne. In 1944 Slawa started teaching at Korowa Anglican Girls School, and in 1947 became Senior Art and Craft teacher at St. Catherine’s Girls School, a position she held for sixteen years. An annual art prize is presented in her name, and in 1992 an exhibition, with an accompanying catalogue titled Mrs. Duldig’s Girls, paid tribute to her work at the school. After her retirement from St. Catherine’s, Slawa continued to teach part-time, and worked on private commissions until her death in 1975. In 1977 a Slawa Duldig retrospective took place at the McClelland Gallery, Langwarrin, and subsequently at St. Catherine’s. In addition to the Duldig Studio her art is represented in private collections in Australia and overseas. Slawa’s work was also shown alongside her husband’s in the Vienna and the Early Twentieth Century exhibition, mounted at the National Gallery of Victoria in 1990. 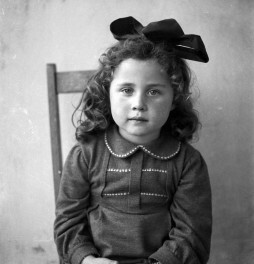 Eva was born in Vienna in 1938, one month before Nazi Germany annexed Austria. With her parents, Karl and Slawa Duldig, she was fortunate to escape to Switzerland later in that year. Shortly after the family travelled to Singapore and then in September 1940 to Australia, where they were interned at Tatura as ‘enemy aliens’ for almost two years. After moving to Melbourne Eva completed her schooling at Korowa CEGGS, and also showed considerable sporting aptitude. She graduated from Melbourne University in Physical Education and Arts and worked as a teacher. 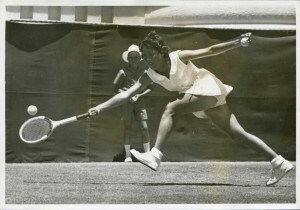 Encouraged by her father, who played international soccer and tennis, Eva became a leading Australian tennis player and in 1961 played at Wimbledon, reaching the quarterfinals. 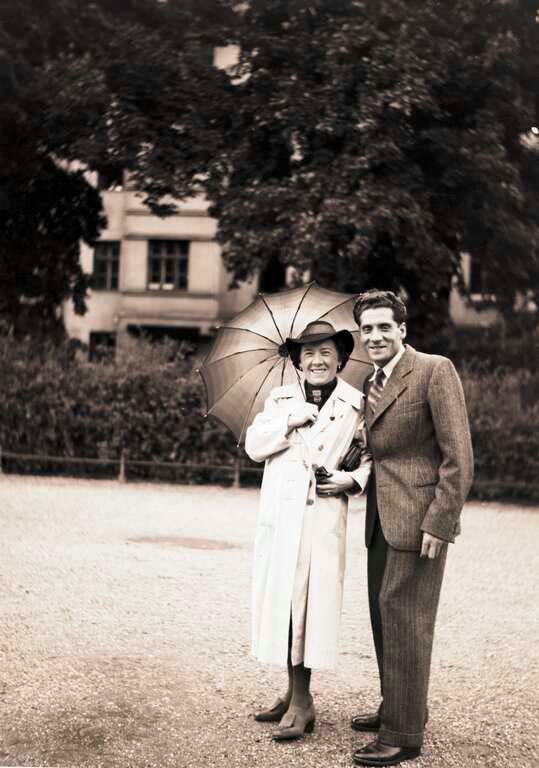 Later that year, at the Maccabiah Games in Israel, she met her Dutch husband, Henri, and went to live in Holland. She became National Champion of The Netherlands and represented Holland at Wimbledon and in the Federation Cup. Eva’s daughter, Tania, was born in Holland in 1964 after which the family returned to Australia where her sons Antony and Pieter were born. Aside from family duties Eva worked as a recreation consultant, writer and a designer of children’s play spaces. After Slawa’s passing in 1975 Eva assisted her father in his artistic practice and when he died in 1986 she became the custodian of the significant artistic oeuvre and personal collections of her parents. She restored the family home, kept all the contents intact and in 2002 facilitated the establishment of a not-for-profit public museum and art gallery known as the Duldig Studio. In her role as Founding Director, Eva initiated many public and educational programs including, since 1986, the Annual Duldig Lecture on Sculpture at the National Gallery of Victoria. With the support of the Austrian government she enabled a Karl Duldig travelling exhibition from the Duldig collection to be shown in Vienna and Krakow in 2003. Another touring exhibition visited seven Victorian regional museums in 2006-08, and Karl Duldig’s work was included in major exhibitions on Viennese art and design at the National Gallery of Victoria in 1990 and 2011. Eva's involvement in community organisations included her role as President of the Bezalel Fellowship of Arts and membership of the arts advisory committee of the Jewish Museum of Australia. She was a founding member and former Chair of the Public Art Committee of the National Trust. In 2009 Eva was made Stonnington Citizen of the Year for Art and Culture. She has written on sport, art and local history in the Australian Jewish News, the Malvern Newssheet and other journals. ‘Women of Letters’ published her story in Yours Truly in 2013. Eva retired as Director in 2014 but continues, as Founder and Patron, to contribute to the Duldig Studio through her personal knowledge of and insights into the family history and the collection. Eva has recently completed a personal account of her family’s remarkable story for publication in a major new memoir – Driftwood (2017).